This was fast and a big hit. Preheat oven to 425. Roasted 2 pounds of asparagus tossed with 2 teaspoons of olive oil and a bit of sea salt for 10 minutes. Be sure to snap off the tough ends of the asparagus before you roast them. 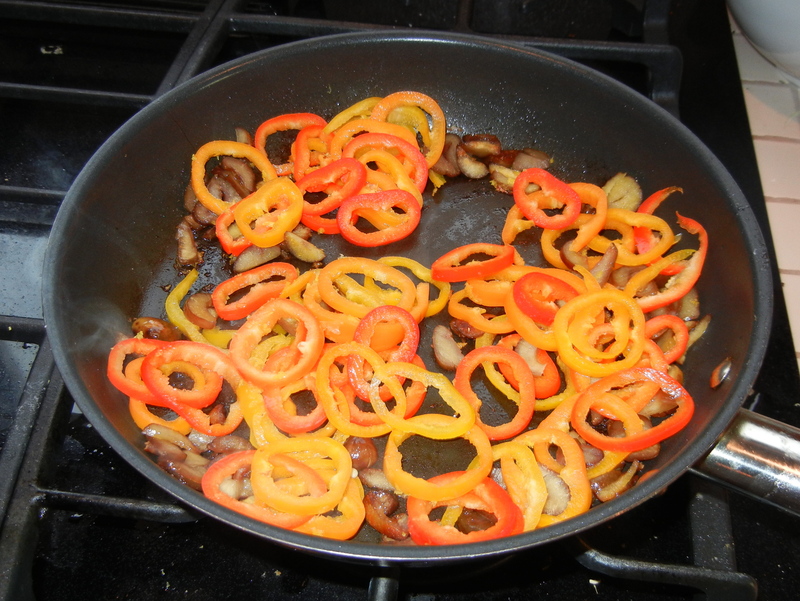 Sauteed 8 thinly sliced roasted chestnuts, 5-6 thinly sliced small colored peppers and the zest from two small lemons in 1 teaspoon of olive oil until the peppers were slightly wilted, then added the juice of one lemon. Removed the asparagus from the oven, sprinkled with the juice of the other lemon, and assembled artistically. Serve warm or at room temperature. Makes 6 servings at about 2 grams of fat/serving. I neglected to take a picture until after it had been half eaten. 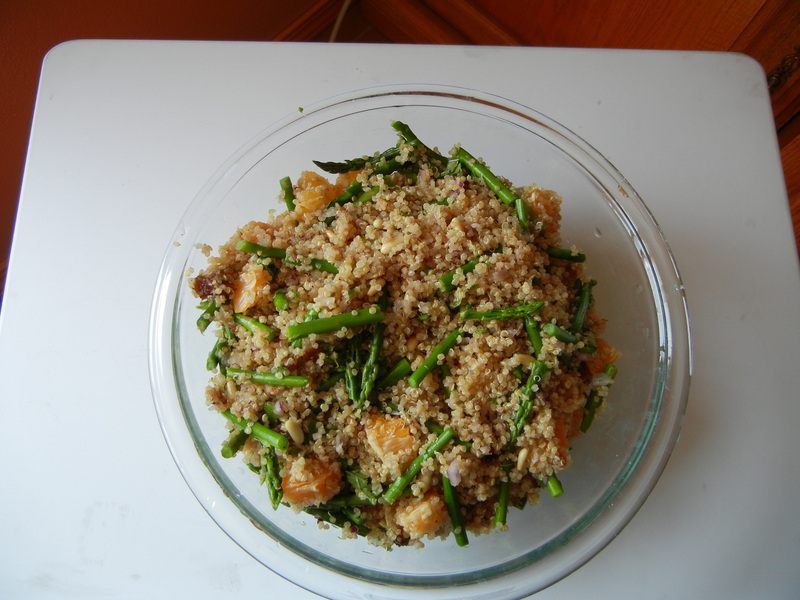 I was browsing about in other food blogs and noticed that The Go Lightly Gourmet, a blogger with a similar philosophy to mine, published several Cooking Light recipes about asparagus. What’s not to like about asparagus! It’s tasty, low fat, and can be very elegant. And this is the season for fresh asparagus. 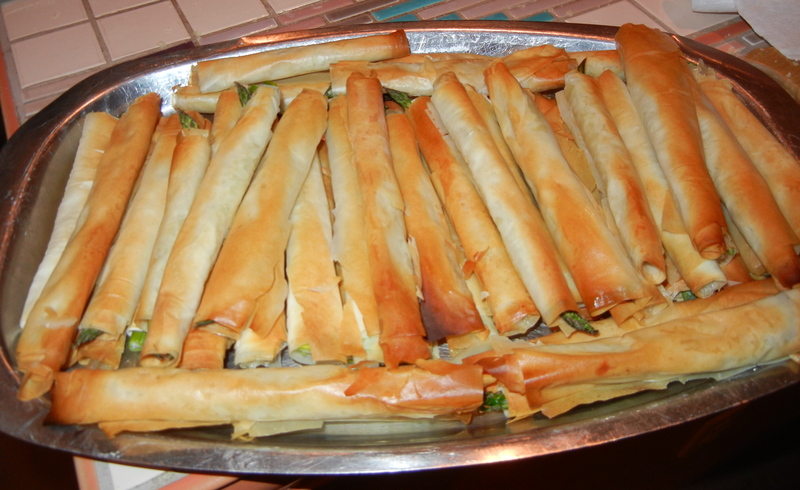 Then I recalled that I made a very elegant Cooking Light recipe for the Passover buffet. It was delicious and beautiful to look at. I’m not sure if you would call it an appetizer, side dish, or salad, but the little that was left was lovely for lunch the next day. 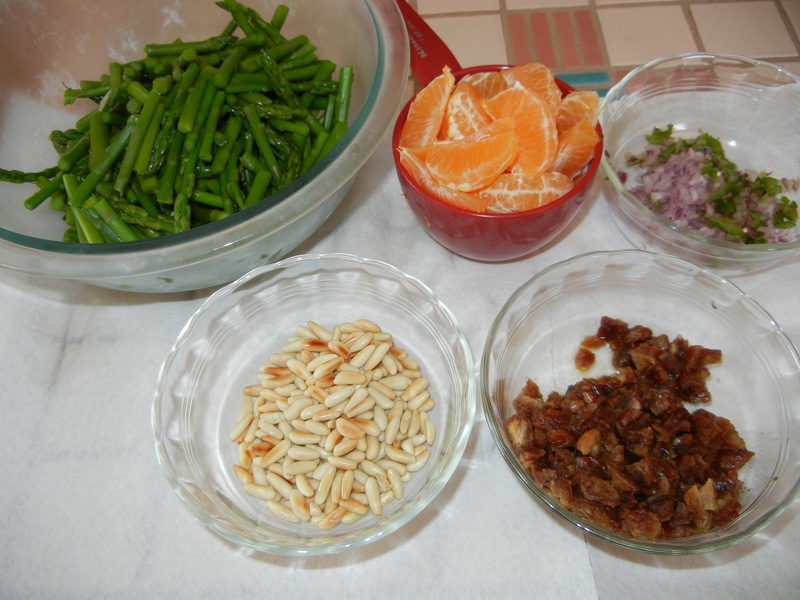 It is also a make ahead dish, because it needs to marinate, which fits my buffet-making schedule. To look best, this is should made with thinner asparagus spears. You could also use two colors of peppers. 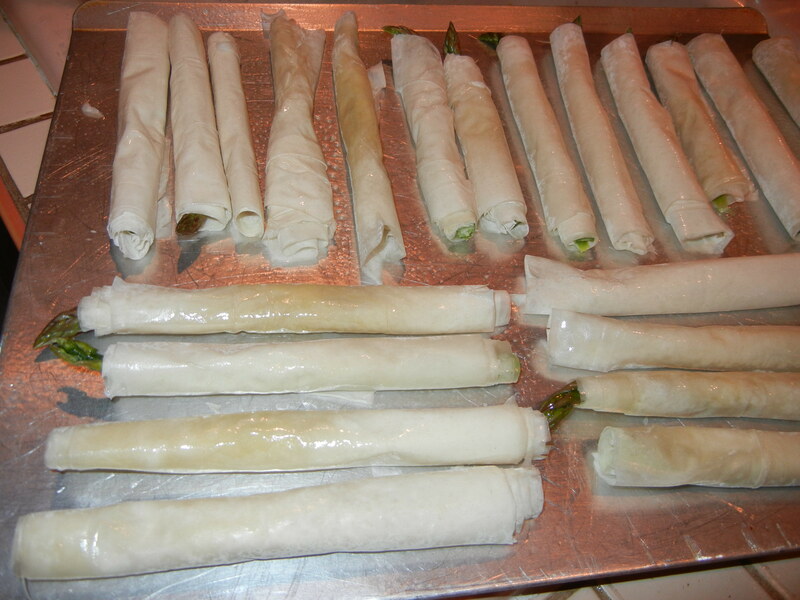 It is not hard to make, but allow a little time, because tying the asparagus into little bundles requires some fussing. I also recommend using more than 10 green onions, because some of the onion ties will be too short or will tear when you get impatient. Snap off tough ends of asparagus. 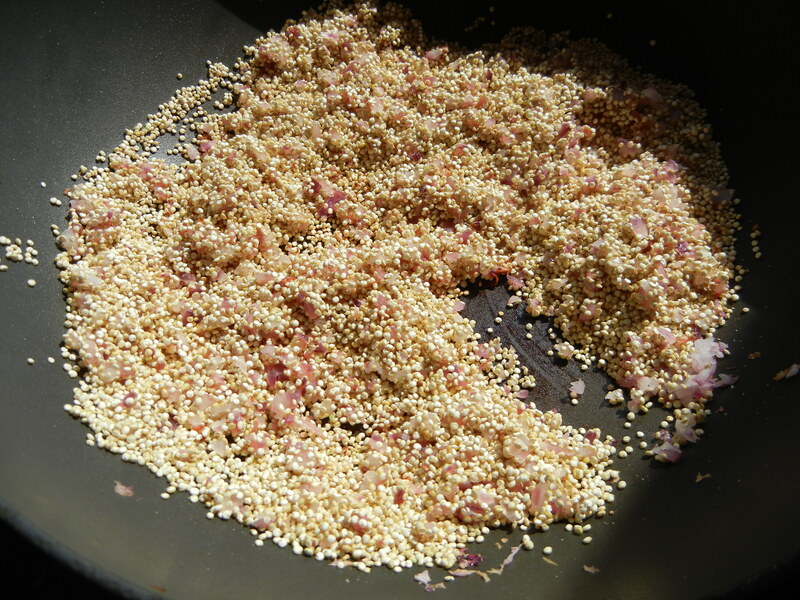 Cover and cook in a small amount of boiling water 5 minutes or until crisp-tender. Drain and rinse under cold running water; drain well. Trim white portion from green onions. Place green onion tops in a bowl; add boiling water to cover. Drain immediately, and rinse under cold running water. 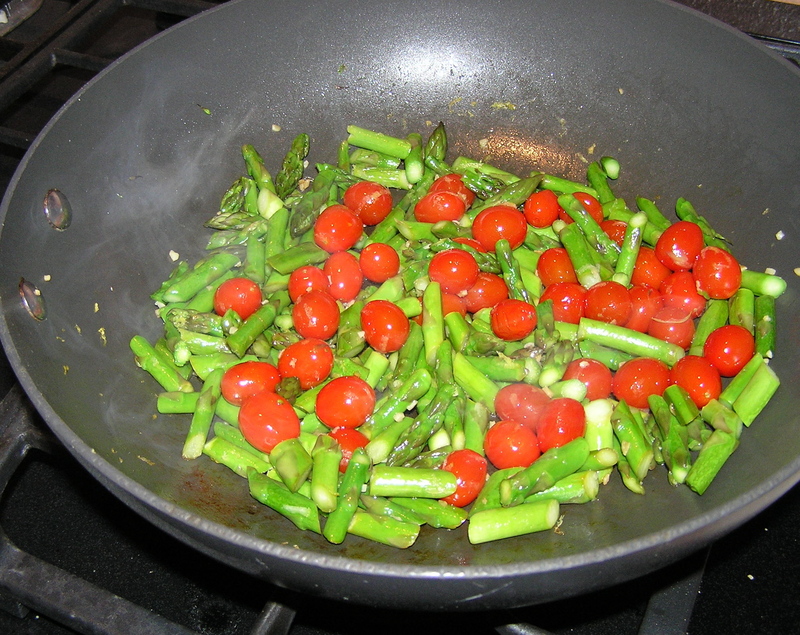 Gather asparagus into 10 bundles, and add 2 bell pepper strips to each bundle. 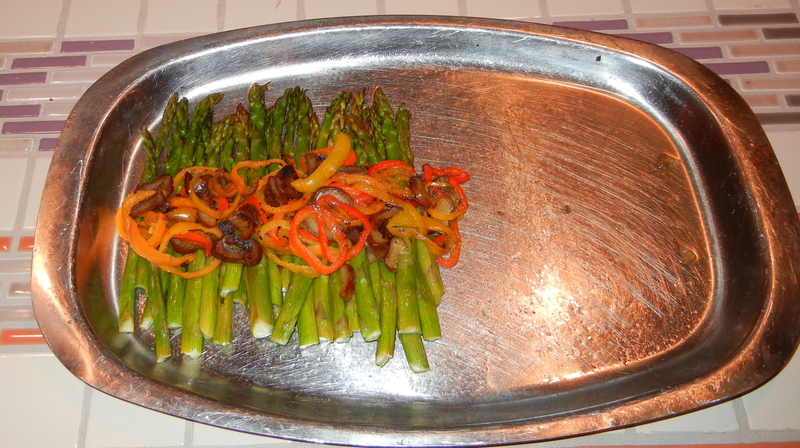 I actually used 5 asparagus spears/bundle, which meant I had more than 10 bundles, and needed more pepper strips. I also think that thinner pepper strips would look a little better. 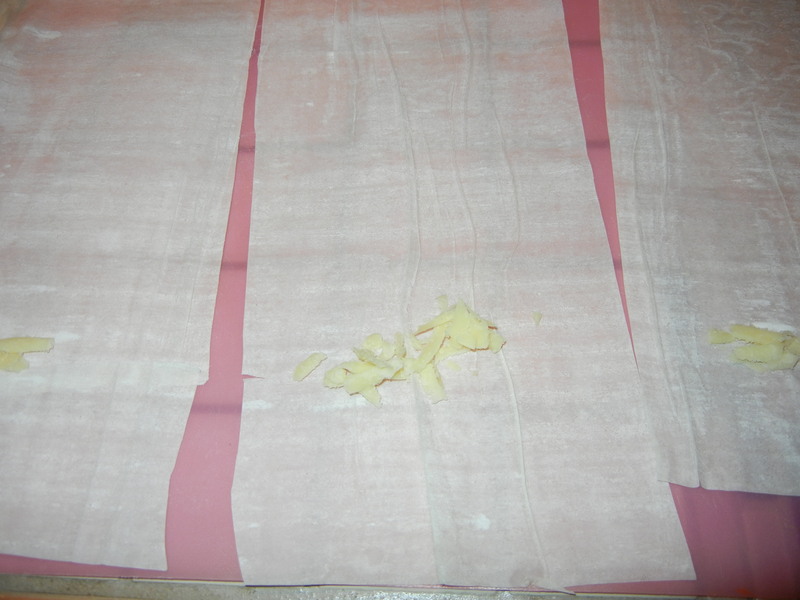 Tie each bundle with a green onion strip. Pull the onion ties closed gently. Place bundles in a 13 x 9-inch baking dish. 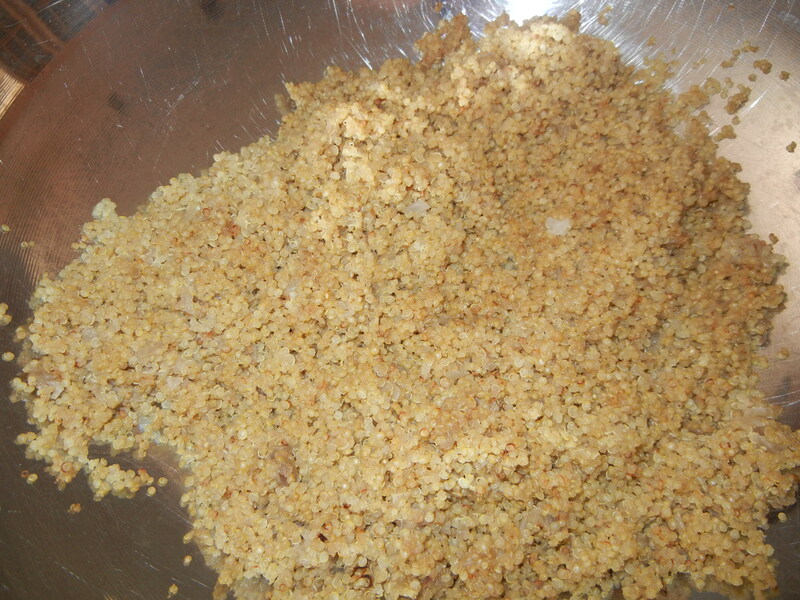 Combine chopped onion and next 9 ingredients (onion through pepper) in a bowl; stir well. Pour over asparagus bundles. Cover and chill 2 to 8 hours. To serve,gently remove asparagus bundles from marinade, and discard marinade. 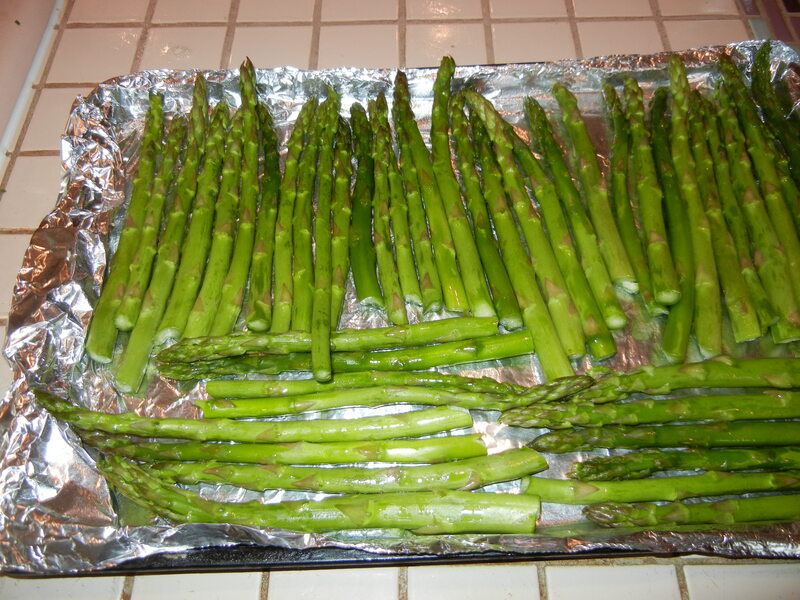 Arrange asparagus bundles on a serving platter. They certainly make an elegant buffet item. 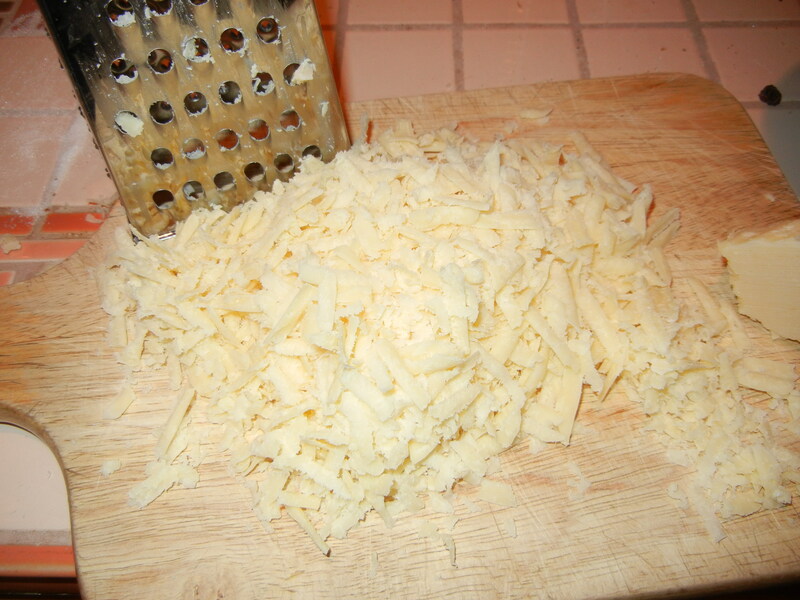 Makes 10 servings (or more depending upon how you divide them) at only 0.3 grams of fat/serving. For some odd reason, the grocery had asparagus on sale this week – in the fall instead of the spring. And it was glorious asparagus – thin and crisp. Who could resist. So I made some very garlicky asparagus in my stir fry pan. It’s a simple preparation. The combination of the tart tomatoes and the earthy green taste of the asparagus just explodes in your mouth. Hint: Selecting and trimming asparagus. Choose thin stalks of asparagus rather than thick ones. Thick asparagus is woody, and you loose a lot when you trim it. Also, try to choose a bunch of asparagus that has stalks that are about even in width, so they cook at the same time. To trim asparagus, grasp a single stalk firmly in both hands and snap it in two pieces. It will separate into a woody bottom and a nice, tender upper part. 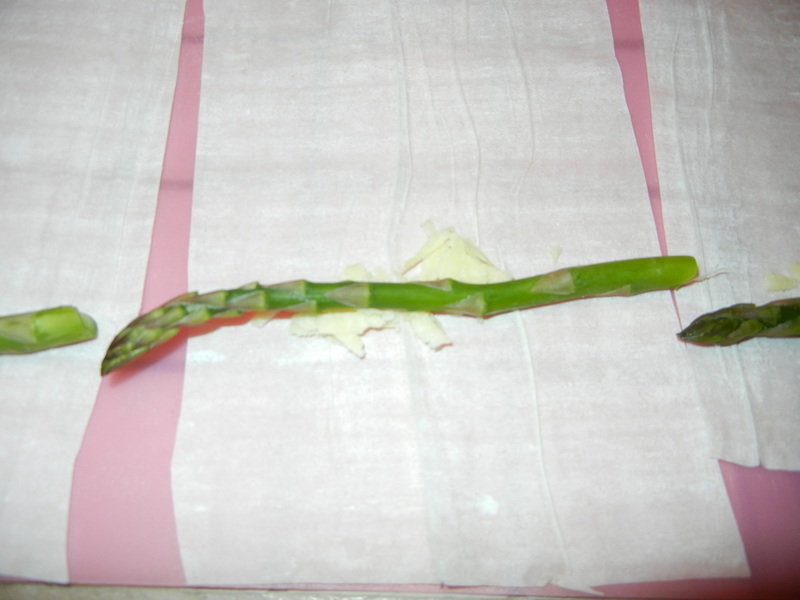 If you have bought slender asparagus, you won’t lose too much of the stalk, nor will you have to peel it.